Provide comfort for the family of Lois Hooks with a meaningful gesture of sympathy. 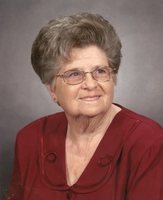 Lois Hooks, age 88, of Stephenville passed away on February 1, 2019. Funeral service will be held at 2:00 PM on February 3, 2019 at the Stephenville Funeral Home Chapel with Neal Wade officiating. Visitation will be at 1:00 pm Sunday before the service. Burial will follow at the West End Cemetery. Lois was born to parents, Jim and Dessie Terry on October 29, 1930 in Erath County. She married James Hooks in 1949 in Stephenville. He passed away on May 4, 1983. Lois was a member of Harvey Baptist Church for more than 50 years. She worked as a salesclerk for many years. Lois is survived by a son, Dwain Hooks of Stephenville and a daughter Peggy Forrest and husband Darrell of Evant, 2 grandsons Daniel Dowell and wife Hannah of Stephenville and Dustin Dowell of Fort Worth. She is also survived by 2 great-grandchildren, Hadley and Maci, along with numerous nieces and nephews. Lois was preceded in death by her husband, James Hooks, her parents Jim and Dessie Terry and 3 brothers and 5 sisters. To send flowers in memory of Lois L. Hooks (Terry), please visit our Heartfelt Sympathies Store.